"Naveen" - 28 Acres of natural beauty. Surrounded by 100s of acres of natural bushland and with amazing mountain vistas, this property certainly offers the serenity that is often sought but seldom found. 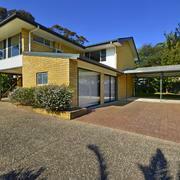 A self-sufficient lifestyle and yet only ten to fifteen minutes’ drive from Moruya. A causal 15-minute walk will take you to the spectacular Deua river where you can have a picnic, a swim or relax and enjoy the quietness of the area. "Luciana" - A large two bedroom manufactured villa style home with amazing Wallaga Lake and mountain views. From the time you set foot into this home you will see that it has been quality built by a local trades person. This villa style home is in good condition throughout. Two Bedrooms, Two Bathrooms. The Views: Located on the high part of the park gives you magnificent views of Wallaga Lake and the distant mountains.